With virtually no government oversight or public outcry, the multibillion-dollar youth marketing industry has used the latest advances in psychology, anthropology, and neuroscience to transform American children into one of the most powerful and profitable consumer demographics in the world. American kids, targeted from birth with sales pitches for everything from Hollywood merchandise and junk food to iPods, cell phones, and the family car, now influence an estimated $700 billion in annual consumer spending. Consuming Kids traces the evolution and impact of this unprecedented phenomenon. Drawing on the insights of children's health experts, media critics, and industry insiders, it blows the lid off the youth marketing industry's stealth tactics and explores the effects of consumerism on the imaginative lives of children. Click here to see an extensive list of organizations, books, and articles to provide you with resources to accompany Consuming Kids. Click here for a series of printable fact sheets about marketing to children created by the Campaign for a Commercial-Free Childhood. Use these sheets to stay informed and to let others know about how marketing harms children. "This powerful, disturbing and heartbreaking film has the power to change the way we Americans treat our children. It is the best possible parent education product. I recommend it to schools, universities, churches, mosques and synagogues." "Consuming Kids is an invaluable resource for parents, teachers, health care professionals, and anyone wanting to foster children's well-being. This film will be opening eyes and sparking discussion in psychology, media and cultural studies, sociology, health, and economics classrooms for years to come. As a professor of media and children's culture, and as a parent, this is the film I've been waiting for." 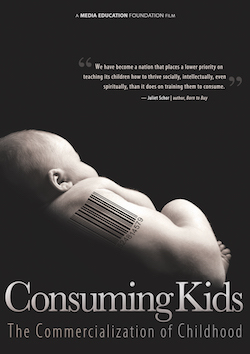 "Consuming Kids delivers an urgent message to parents, educators, and government regulators about the troubling intrusion of marketing into children's lives. Watch this -- and then turn off your kids' TV." - Pamela Paul | Author of Parenting, Inc.
"Like never before, children today are plagued by a variety of ills, from violence to hyper-sexualization to obesity to rampant materialism. Consuming Kids connects these dots, showing how these problems all relate back to corporate marketers preying on our children for profit. Watching this movie will open the eyes of everyone who cares about children to the disturbing new realities of our consumer culture." "This film graphically reveals a lack of corporate respect for the young. We have a moral duty to transform societal values and create a culture that respects the children with whose care we are entrusted. Now is the time to call for a child-honoring protocol for commerce." "This film is a damning indictment of an advertising industry whose only concern is brainwashing kids as early as possible, no matter what the consequences. The film's powerful images that back up the experts' claims are jaw-dropping. And if you think it's all up to parents to protect their kids from the onslaught of corporate marketing, this film will convince you otherwise. Consuming Kids should be viewed by anyone who has kids or cares about them; in other words, everyone." "A comprehensive and compelling look at how childhood in America has been sacrificed to the free market. This film helps parents, caregivers and educators to start thinking differently about popular culture and children, and what needs to change." "Marketing to children is pervasive, powerfully effective, and pernicious. This film paints a compelling picture of our children being initiated into consumerism almost from birth, as if it is a special club, and shows how important it is to stop the madness." "This film is a riveting and compelling expose of the enormous -- and enormously cynical -- enterprise devoted to transforming our children from kids into consumers. Anyone who wonders why kids are so demanding of brand-name products must see it. This film provides tons of evidence to explain why we need federal regulation of marketing to children, and the sooner the better." "Consuming Kids is one of the best films I have seen in years that explores the various ways in which the identities, values, and future of young people are held hostage to a world shaped by the poisonous culture of consumption and commodification. Every school should buy this film and learn from it. And every parent, educator, and concerned citizen should watch this film if they believe kids deserve a more just world and future." - Henry Giroux | Professor of English and Cultural Studies at McMaster University | Author of Youth in a Suspect Society: Democracy or Disposability? "Consuming Kids is my all time favorite video exploring the negative aspects of advertising in all venues and on all media platforms. It is a wonderfully produced and thought out documentary that remarkably and informatively covers so many critical areas of how corporate America uses its power to amorally define, research, and manipulate various demographic segments of society. In so doing, the film homes in on corporate marketing strategies designed to maximize impact and sales -- and the health of children and teens be damned! This exceptional film will be a service to schools, parents, and children for many years to come." "Every parent, stepparent and family professional must understand the impact of marketing on children. The most efficient and compelling way to begin is to watch Consuming Kids, the film that will open your eyes to the biggest difference between today and when we were kids: sophisticated and pervasive marketing to children. Your kids can't afford for you to wait." "Consuming Kids shines a bright and probing light on the powerful forces of commercialism that are reshaping childhood. Contemporary marketers have developed a panoply of techniques -- from focus groups to "parties in a box" to brain research -- for engaging and influencing children, often under the radar of parents. The tentacles of modern marketing now penetrate every aspect of children's lives -- on television, in school, and through an array of new digital media, including interactive games, mobile phones, and 3-D virtual worlds. With its vivid imagery, this thoughtful and well-researched documentary explains it all." "An outstanding film with an urgent message, Consuming Kids is remarkably researched and elegantly executed. It leaves no room for doubt that relentless marketing to children is hurting their mental and physical health. Turning a child's sandbox, filled with so much imaginative potential, into a shopping mall is a crime. It is not what children consume, but what they are directed to think and feel about themselves and their world that is really at stake."